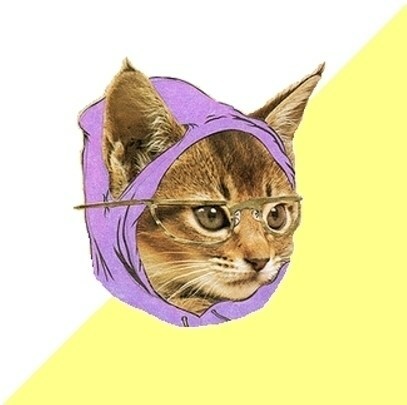 Hipster Kitty, also known as Hipster Cat, shows the head of a cat wearing a hoodie and glasses. This expands on the hipster meme, which is basically a person who considers themselves to be so “hip” that they in effect out-hip themselves (and everyone else around them), shooting them to a level of hipness that ends up actually being a little bit silly. Most of their time is spent worrying about how un-hip everyone else is, and reaffirming their own hipster credibility amongst themselves by quoting obscure poetry and wearing all the right (mostly vintage) clothes. Hipster Kitty spouts all kinds of witty sayings, hipster-style. The artwork was taken from a painting called “Allison”, done by artist Craig Wheat. Thankfully, Wheat has a sense of humor about what his original art has spawned, calling the new take on his art an “ever collaborating beast”. Hipster Kitty began appearing in 2009. The term “Hep Cat” and its derivatives were originally part of a much older era, back in the days of jazz music and live band performances. This term described someone cool at the time, and was a positive appellation without any irony. Notable Hipster Kitty quotes include “Enter coffee shop – stay all day”, and “I donated to Haiti … before the earthquake”.